Be sure you don’t miss Part 1 of this story. Saturday, August 27, dawned bright and clear. It was almost cool at breakfast, but promised to get quite warm by afternoon. A different plan had been arranged for this day’s wine adventure as Laurie Ware and her husband, Shelly, met me at the hotel in his pickup. We arranged our gear, loaded the ice chests and YETI Hopper, and piled into the truck. Shelly was at the wheel while Laurie handled navigation duties. The first destination was the historic district in Grapevine. As the highways were relatively clear at this time on Saturday morning, it did not take long to reach Grapevine, and we even found a very convenient parking spot just off Main Street. Since we had arrived a bit before the tasting rooms opened, we made our first stop at a market featuring local produce and products. I could not get past the local honey offerings, and purchased two jars to bring home. We wandered down the block to the tasting room for Bingham Family Vineyards. 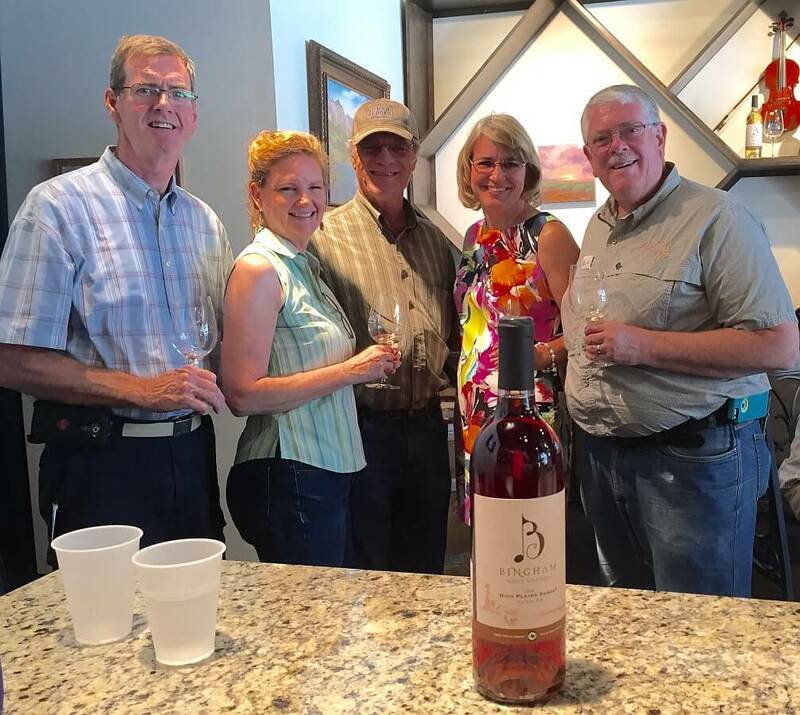 The Bingham family is well-known in Texas farming and grape growing circles, and recently they have ventured into the winemaking business. The tasting room is relatively small, but well-appointed. 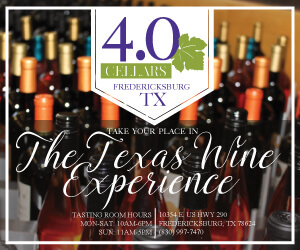 Shannon Brown met us at the tasting bar, and during the introductions, we learned that Shannon and her husband had lived in Fredericksburg where she worked at Pedernales Cellars. He is a jet mechanic and had recently been offered a great opportunity with a company at the DFW Airport, so they had moved to the Dallas area. Shannon then set us up for a tasting and offered a range of wonderful wines to sample. Viognier 2014 – This Texas favorite smells of honeysuckle and lily blossoms; the taste was rich, full-bodied, and very pleasant. 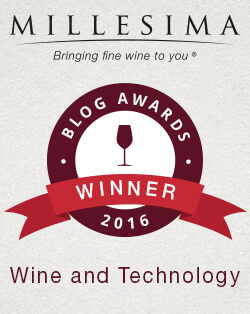 A Silver Medal winner at the 2016 San Francisco International Wine Competition (SFIWC). Cloudburst 2016 – This blend of Trebbiano, Vermentino, Roussanne, Viognier, and Chardonnay had an apple aroma with citrus and floral notes; it was smooth on the palate with a soft, easy finish. A Silver Medal winner at the 2016 SFIWC. High Plains Sunset 2014 – This pleasant dry rosé (from Mourvèdre grapes, I believe) showed lovely strawberry notes on the nose and palate. Turnrow 2014 – This blend of Mourvèdre (40%) and Tempranillo (60%) was light and spicy with strawberry and red cherry aromas and flavors. 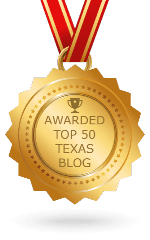 A Silver Medal winner at the 2015 Lone Star International Wine Competition. 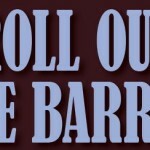 Dug Out – This full-bodied blend of Cabernet Sauvignon, Merlot, and Cabernet Franc was oak aged to deliver cranberry and black currant fruit aromas and flavors, along with notes of saddle leather and creamery butter. 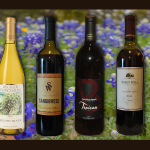 A Gold Medal winner at the 2016 Houston Livestock Show and Rodeo Wine Competition. Dolcetto 2014 – This wine revealed a medium body with fruity aromas of strawberry, raspberry, and smoke. The mouthfeel was rich and warm with strawberry and cherry fruit and a bit of dusty minerality on the finish. 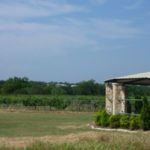 Dirt Farmer – This wine had recently been reviewed by Jeremy Wilson for Texas Wine Lover and we were eager to try it. A blend of Tempranillo, Merlot, Dolcetto, and Cabernet Sauvignon, this dark, rich wine offered aromas and flavors of blackberry and dried figs. The finish was long and bold, with a nice dose of High Plains dusty tannins. A Silver Medal winner at the 2016 SFIWC. Petit Verdot 2014 – This wine had just been delivered to the tasting room. It was dark and bold as one would expect from Petit Verdot, but the tannins were mellower than anticipated. Black plum and cherry fruit washed over the palate leading to a long and satisfying finish. 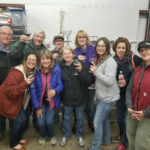 As we were finishing the tasting, Cliff and Betty Bingham came into the tasting room and we proceeded to engage them in what turned out to be an extremely pleasant visit and wine discussion that lasted nearly 30 minutes. 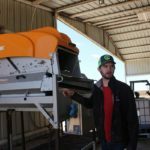 Having spent a lot of time in the High Plains area over the years, coupled with the fact that parents and many other family members have resided in Lubbock, Tahoka, and New Home, I had heard about the Bingham family and their farming efforts for years. It was great to spend time with them, discussing their grape growing project and their expansion into the winemaking business. They even knew some of my relatives in New Home, just east of their location in Meadow. What a special treat for us! I hope Cliff and Betty enjoyed it as much as we did. Just to digress a bit, the Bingham wines were quite good, better than I had originally expected. A lot of quality has gone into growing the fruit and plenty of talent into making the wines. 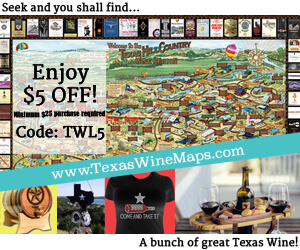 I encourage Texas wine lovers to seek out these wines and enjoy some delicious offerings from the Texas High Plains. The next stop was just two blocks away, Sloan & Williams Winery. 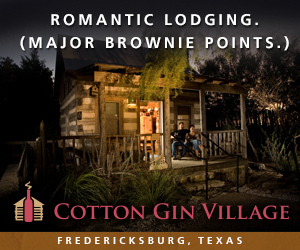 The tasting room is large with lots of tables and another Texas-sized bar for tastings. We took seats at the bar and met Colleen who offered to handle our tasting. There were several options to consider, and we chose the Texas High Plains AVA Flight with four wines for $12.00. We also noticed the enticing aromas coming from the pizza kitchen situated in the tasting room, and ordered two pizzas for lunch since the time was now well past noon. Roussanne 2014 – Texas High Plains. This wine offered citrus and herbal aromas with lemon drop and tea leaf flavors. There was just a hint of sweetness on the easy-to-enjoy smooth finish. Texas Yellow Rose 2015 – Texas High Plains. This was a six-grape blend – Roussanne 11%, Muscat 17%, Vermentino 16%, Chenin Blanc 18%, Albariño 18%, and Viognier 20%. The aromas were of citrus peel and pit fruit (peach, apricot) and a bit of honeysuckle. The flavors included orange, apricot, and green apple with a nice crispy finish (less sweet than the above). Tempranillo 2014 – Texas High Plains. This offering was light in color and body with soft cherry and strawberry aromas and flavors. With its hint of sweetness, this would probably go well with BBQ or even the red sauce on the pizzas we ordered. 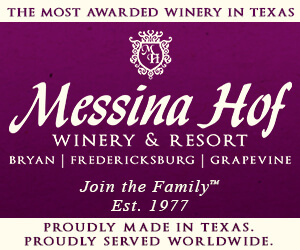 Sangiovese 2014 – Texas High Plains. This was, again, fairly light in body and color. Red licorice and cherry cola aromas rose from the glass, and these were echoed in the flavors with some delicate oak nuances. This was pleasant and easy to drink with mild tannins on the finish. After the tasting, we discussed a pizza wine with Colleen and decided to go with a bottle of California Nebbiolo. It was darker, richer, and a bit more tannic than the previous two reds, and accompanied the pizzas perfectly. We finished off lunch, enjoyed a large glass of cool water, and headed to the truck. It was time to move further north. The drive from Grapevine to Eden Hill Vineyard took less than an hour and thankfully traffic was reasonably light. Laurie and Shelly knew the proprietors, the Hornbaker family, and we all knew the assistant winemaker, the inimitable Dave Potter. Upon entering the tasting room, we were welcomed by Carrie Fletcher and none other than Clark Hornbaker. They had prepared a table for us in the bright and cheery tasting room, and we settled into our seats. Clark sat to join us for the tasting and soon we were served the first wine by Clark’s wife, Linda Hornbaker, and Carrie. They also brought a tray loaded with various cheeses including a lovely goat cheese, grapes, meat slices, fig preserves, and crackers to accompany the wines. While enjoying a wonderful visit with Clark, learning about Eden Hill and the family history with the estate, we tasted the following wines. Roussanne 2015 – This was similar to the above, just fresher and overall leaner in body and flavor. Aromas of citrus and honeysuckle rose from the glass and soft peach and apricot flavors flowed across the palate. The finish was well-balanced with notable acidity. Albariño-Viognier (50/50) 2015 – This was delicious with lip-smacking acidity and a mélange of fruit aromas and flavors. A Gold Medal winner at the 2016 San Francisco International Wine Competition (SFIWC). It certainly deserved a gold medal in my book! Montepulciano 2015 – Oswald Vineyard in Terry County. This was fun to taste and compare to the recently released 4.0 Cellars Monte by Brennan Vineyards. The wine was relatively light in body with black cherry and plum fruit aromas and flavors. The finish had a minerally, herbaceous tang that is common to the variety. Nicely done. Chambourcin 2015 – Fruit sourced from Dr. Bobby Smith’s estate, La Buena Vida Vineyards; 78% Chambourcin and 22% Montepulciano. This was a special treat that Clark poured for us following a discussion of the Chambourcin wines I helped make at Heritage Vineyards in New Jersey. The wine has yet to be released by Eden Hill, and after tasting it, I thought another two to three years in bottle would be needed for the wine to show its best. Dark purple and black in color, plummy, smoky, really rich on the palate and long on the finish. Very little tannin as expected from a French-American hybrid. I like to call Chambourcin the gentler “cousin” to Zinfandel because it carries a lot of the same dark colors, aromas, and flavors, but not the tannins. A special thanks to Clark, and the winemakers, Chris Hornbaker and Dave Potter, for this fun and special wine. I have tagged a bottle of Heritage Vineyards Chambourcin from the Outer Coastal Plain in NJ to take to the Hornbakers on my next visit. Aglianico 2014 – Oswald Vineyard in Terry County. Laurie noted that she helped bottle this wine. It was unfiltered as the filter system kept malfunctioning during the bottling run. This was dark and moderate to full-bodied with black plum and blackberry fruit aromas and flavors, plenty of herbal notes, hints of smoke, and fairly gritty tannins at the finish. This would go well with grilled sausage or smoked meats. Aglianico is a classic variety that is native to the southern Italian regions of Campania and Basilicata. From the Province of Avellino in the Campania region near Naples, Aglianico wines are known as Taurasi or Taurasi Riserva and carry the prestigious designation of DOC or DOCG. The Aglianico grape variety is also grown in the volcanic soils of the Basilicata province just south of Avellino. The popularity of these regional wines is a relatively new phenomenon since Mastroberardino was the only producer to export Taurasi until the early 1990s. Now Italian Aglianico wines are more commonly found in Texas wine markets. 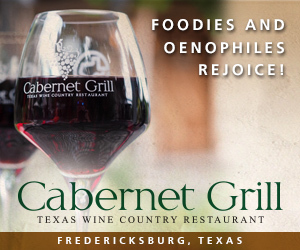 This classic variety does very well in the sunny, arid Texas climate, and the Eden Hill version is one of several that come to mind that highlight the strength of this grape in our great state. About this time in the tasting, both Dave Potter and Chris Hornbaker made appearances at our table, and Chris eventually joined us for the last two wines. Divine Red 2015 – This was a blend of Spanish and Italian varieties, Tempranillo 72%, Aglianico 23%, and Montepulciano 5%, sourced from Dr. Bobby Smith’s estate and Oswald Vineyard in Terry County. After tasting these varieties in the wines above, this was pretty much what one expected. It was relatively dark, loaded with black fruit aromas and flavors, and finished with a definite dose of dusty Italian-style tannins. A really fun wine. 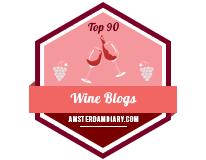 Tempranillo 2013 Estate – This was very special, indeed! The dark cherry fruit aromas jumped from the glass, and the cherry character continued as the wine washed over the palate. There were some soft, almost creamy notes that were a bit surprising since the wine had not seen oak (neutral flex tank with no oak staves). The finish was clean and long with ripe tannins and some light Texas road dust. Everybody really enjoyed this one and complimented Chris, Dave, and the whole family and crew. Eden Hill Winery was a fantastic stop on our wine trail. The tasting orchestrated by Carrie Fletcher, Linda Hornbaker, and Clark Hornbaker was terrific, and we were treated like royalty (or maybe rock stars). Such fun folks and good wines! As the hour grew late, we finally departed Eden Hill and drove to a nearby location that Laurie was eager to visit. 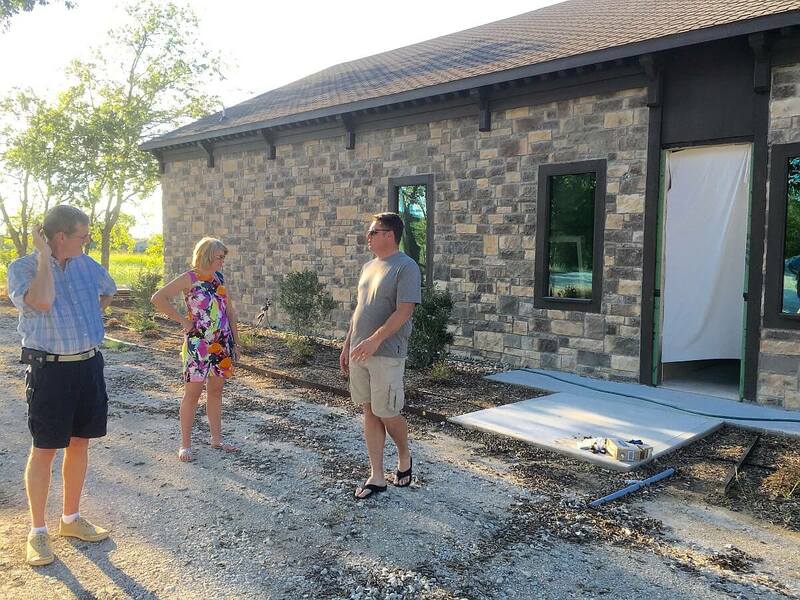 She had previously met Lance Haynes who was building an events center and tasting bar near the Eden Hill site to serve the Celina community. We met Lance in front of his facility, called Humphreys, and he took us on a tour of the site which was nearing completion of the construction and renovation phases. There was a large outdoor deck where originally there had been a horse barn. The frame of the barn was still there, but was not covered. The deck was very spacious and inviting, and situated to the east of the main building so as to be shaded in the afternoon and evening. The large main building had lots of windows, a stage area, a dance floor, and a well-designed bar in the back. 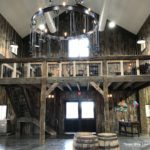 When completed, this will be a fun destination for folks that want to book a party or special event. We piled into the truck and Shelly took us through the countryside to the Interstate where we headed back to Dallas, Fort Worth, and Burleson. We spotted a Saltgrass Steak House in Granbury and opted to stop for a nice dinner. Like the previous evening, a cold beer seemed more appropriate than wine. The meal was delicious, and we sort of languished at the table, not really ready to call an end to this marvelous day of wine adventure. Eventually we made the drive back to Burleson where Laurie and Shelly dropped me off at the hotel. They headed on home to Cleburne and I headed straight to bed. It had been a marvelous day filled with lots of delicious wine, wonderful people, and great memories. On Sunday, it was time for me to make the drive back to Fredericksburg. A call from Laurie let me know that I had left the jars of local honey purchased in Grapevine in the back of their truck. 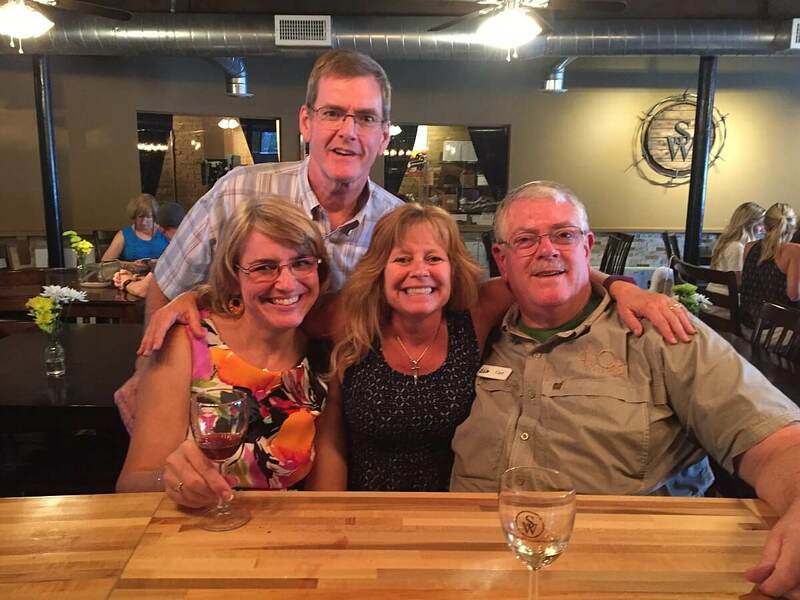 So, I met Laurie and Shelly in Joshua to pick up the honey, and enjoyed one more opportunity to thank them for joining me in a wonderful weekend wine adventure to the DFW area and Red River Valley. On the way home, I decided to make one more stop at Texas Legato west of Lampasas. The drive west of town was picturesque and the winery/tasting room sits on a lovely property backed by vineyards and woods. 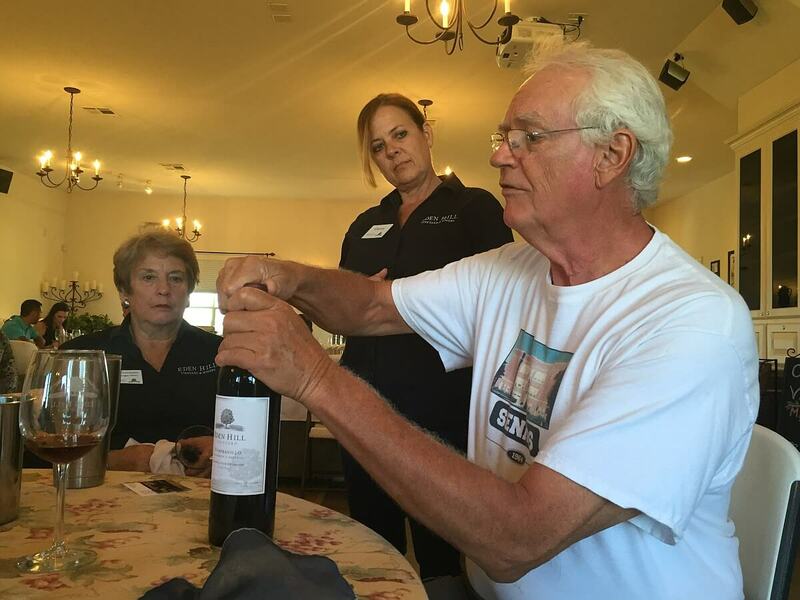 Upon entering the tasting room, I was greeted by Bill Bledsoe, proprietor of Texas Legato, who had been a participant in the earlier picnic tasting and dinner held on Thursday at Lost Oak winery in Burleson. Also present were Bill’s wife, Sulynn, who was working in the office, and Bob Wonacott who was helping with winemaking duties. Bill, Bob, and I visited at the tasting bar for a bit while tasting several wines. As noted earlier, at this point in the trip, I had pretty much given up taking notes on wines tasted. We then went to the back room where many wines were in the process of fermentation or maceration in tanks or bins. Again, some tasting and much discussion ensued. Bob departed for another engagement, so Bill and I went out to the beautiful covered porch facing the vineyards to the east. 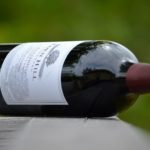 We spent some time visiting and discussing a number of wine-related issues, all the while enjoying the comfortable wooden rocking chairs on the porch. Bill’s brother, Gill Bledsoe, proprietor of neighboring Pillar Bluff Vineyards, made a brief appearance. It was nice that Gill stopped by since I had neither seen nor spoken with him since the February Texas Wine and Grape Growers Association (TWGGA) meeting in Frisco. It was finally time to finish my drive home to Fredericksburg, so I said my goodbyes to Bill and Sulynn, and returned to U.S. 281 south. Arriving home felt great, and my mind and heart were filled with so many good memories of my North Central Texas Wine Adventure. Thanks to all who made this trip so special. Until next time, may you all have good vintages and great wines. Fun. Wine. Time.